Purna Matsyendrasana - "Full posture of Matsyendra" - the King of the Fishes. Matsyendra was a teacher of Yoga who in many myths learned directly from Lord Shiva. Twisting symbolizes revolving; turning our consciousness back in upon itself - offering a light into the darkness and bringing the dark into the light - a process essential to the practice of yoga. 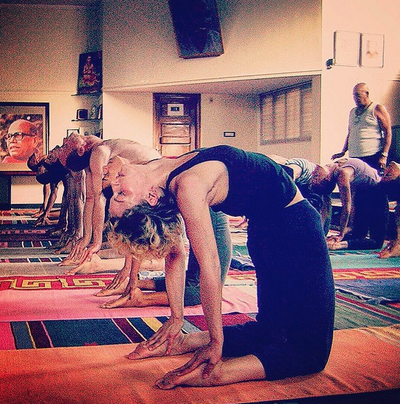 Yoga is a systematic way of purifying the body to liberate the mind. Utthita Parsvakonasana B also sometimes called Parivrtta Parsvakonasana "revolving side angle pose." 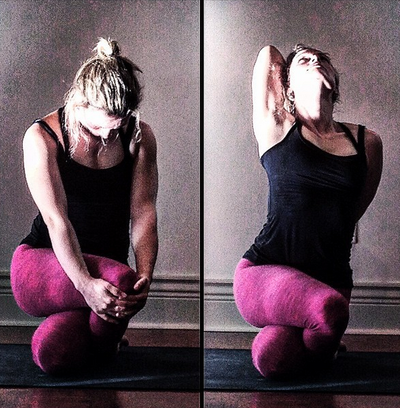 This #asana is the second spinal rotation in the Primary Series. This powerful twist develops the integration of Breath and Bandha together. A challenging posture for sure - especially if you move into the completed twisted position without lifting your back heel and on a single exhalation. The development of mula / uddiyana bandhas will greatly assist in creating an unrestricted flow of breath as you hold and deepen this posture. Prasarita Padottanasana A: "Spread Out Foot Intense Stretch" - The full expression of this posture has the hands shoulder distance apart and the feet, fingers, and top of the head all in a line, while the head presses firmly into the earth between the hands. 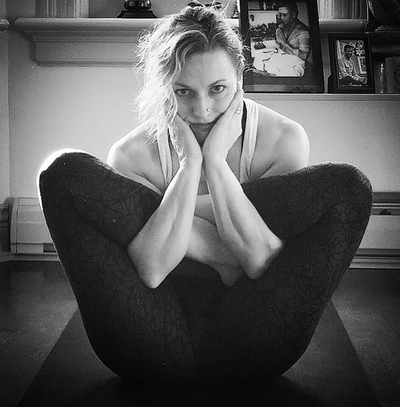 Gomukhasana traditionally called "Cow-Face-Pose" has two variations in the Ashtanga Yoga Intermediate Series. The first turns your focus inward and the second teaches you to maintain an inward attention while extending your heart and gaze up & out. At times I have felt like I was in direct communion with God while practicing this posture. 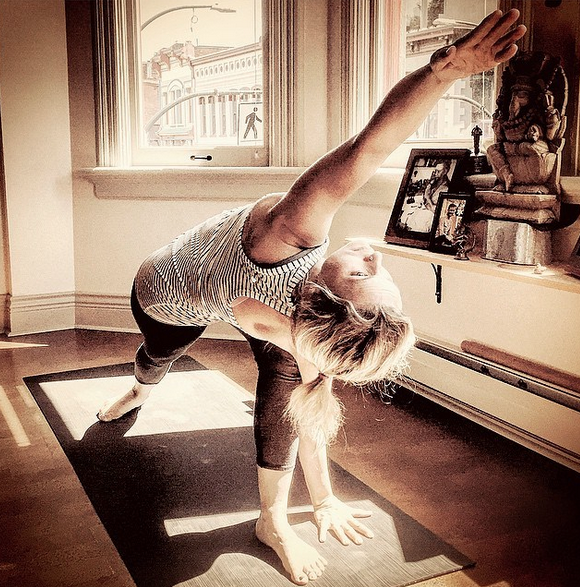 It is a beautiful metaphor of worship and how we are to be as yoga practitioners in life: Inwardly aware at all times sustaining that steady connection to our Center & Source. The Sanskrit word गो "Go" can mean both "cow" and "light" & the word मुख "Mukha" means "head, face, or mouth." So Gomukha may refer to the inner light of the head as well as the face of the cow. Bakasana "Crane Posture" - The crane is a long-legged & long-necked bird with a streamlined body and large rounded wings. They form monogamous life-long bonds making them a symbol of fidelity, loyalty and success. In many Asian cultures they also represent good fortune, healing, happiness, and longevity due to their legendarily long life spans. They are the world's tallest flying bird. The first Sanskrit śloka ever uttered by the great sage Valmiki was inspired upon the death of crane. "You will find no rest for the long years of Eternity For you killed a bird in love and unsuspecting." 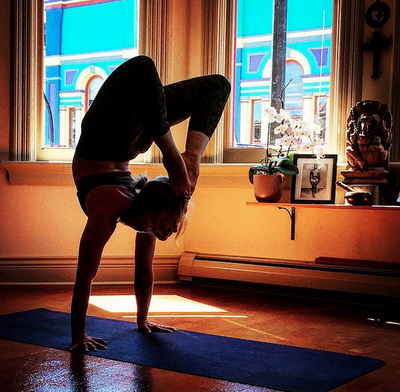 #Vatayanasana "Vata" means 'Wind' and "Yana" is 'Vehicle'. The composite word "vatayana" means: ‘a flying horse’ or ‘a horse that moves like the wind’. To raise the body utilizing the muscles of only one leg makes this #asana more difficult than it might upon first glance appear. The arms are used both to create balance and to guide the upward movement. If you watch someone get into this position you can see how the arms act a bit like wings and are used to help raise the body in a way that is similar to the wings of a Pegasus taking off. 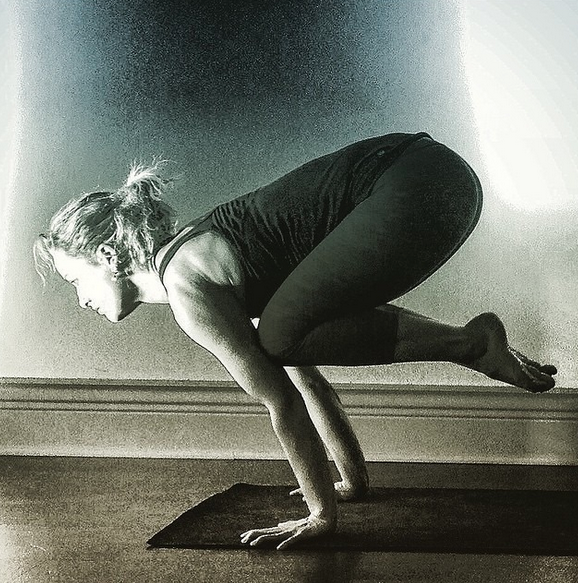 Titibhasana is sometimes referred to as "firefly" or "insect" pose, but the actual #asana is named after a small bird. Have you ever wondered why so many postures are named after animals in yoga? One answer that an Indian Sage once told me was that each asana regularly practiced slowly unties the knotted "vasanas" (karmic imprints / behavioural tendencies) that we've accumulated from past life impressions. This idea that our unconscious mind is affected by every birth we have ever taken explains the evolution of the transmigrating soul on its way through space & time to attain its ultimate Realization & Awakening. The postures that relate to different animals start to untie those knots associated with the lower tendencies within ourselves that are effecting our behaviour in this current life. GarbhaPindasana Garbha = Womb & Pinda = Embryo - Together they are "Embryo-in-Womb-Posture". 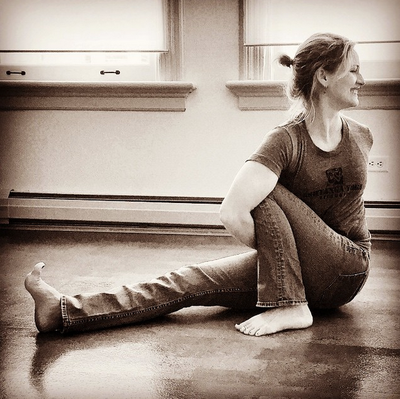 When I was first introduced to this posture I was told to roll 9 times representing 9 months in the womb. Sharath and Guruji though would only ever count to five during the rolling part of this posture. Once a student asked Sharath if we needed to roll 9 times, and he laughed and said 5 was enough, but "just roll as many times as you need to get around." Just like that: pragmatic & simple. No story or myth - just do what you need to do and get on with it. Kind of like the practice. Keep it simple. 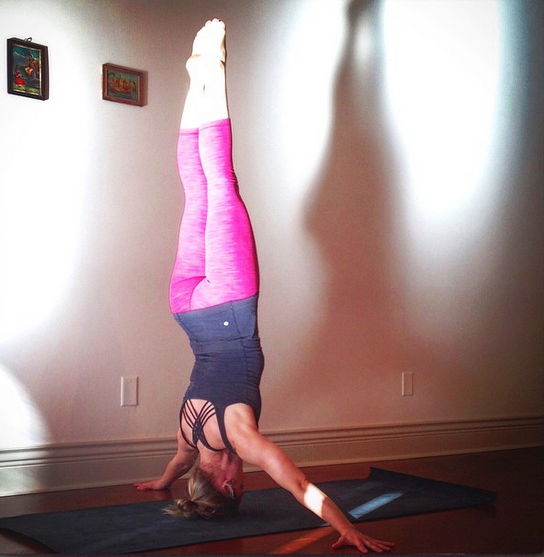 #muktahastasirsasana This is the first of seven headstand variations that come at the end of #IntermediateSeries in the #AshtangaYoga practice. Mukta = "free, liberated" Hasta = "hand" Shirsha = "head" #Asana = "seat, posture, pose" The ancient texts call #Shirshasana the King of all asanas. It is said that headstand is a tonic for those who become quickly fatigued. 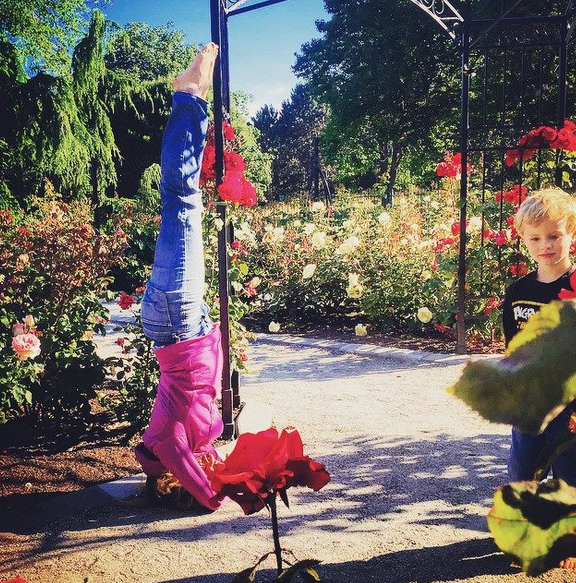 So instead of reaching for the chocolate or coffee or taking a nap the next time you you get that mid-day lull, why not try to turn things upside down and stand on your head instead! Note of caution: this posture should not be attempted without first receiving proper instruction from a qualified teacher. If you have Glaucoma DO NOT Attempt. 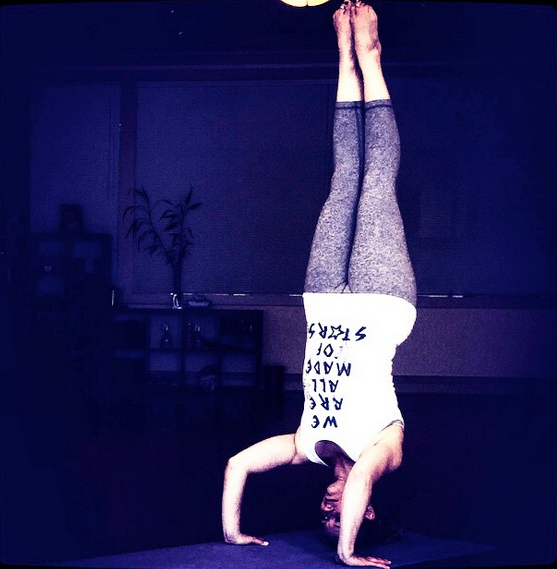 Eye pressure doubles within seconds in inversions. As well, if you have uncontrolled high blood pressure please do not perform it without checking first with a medical doctor. Additional Note: practicing in a Barry Silver GBSK shirt makes you look better even on a bad day! UrdhvaDhanurasana - “Upward Bow Posture” I’m always reminded of the great Indian Epic the Ramayana whenever I practice any of the “bow” postures, and the story of the Shiva Dhanush - the Divine Bow of Shiva. This bow was given to the ancestor of King Janaka by Shiva. No ordinary human could lift this bow, and a selfish person someone could not even approach it. King Janaka had an adopted daughter named #Sita (an avatar of Lakshmi, the goddess of wealth & wife of Vishnu) who when she was a small girl playing with her sisters had lifted the table upon which the bow had been placed, something no one in the kingdom could do. When it came time for King Janaka to find a suitable husband for Sita he knew she would need to find a very special man, so he devised a test: Sita would marry the man who could lift Shiva's Bow, string it, and shoot an arrow from it. This task was impossible for any ordinary person. However, Rama (an avatar of Vishnu) the Prince of Ayodhya comes to contest and he not only lifts the bow, but strings it so tightly that the bow breaks in half! This feat of strength spreads his fame across the kingdoms and seals his marriage to Sita. True Love. Laghuvajrasana Laghu = little Vajra = Thunderbolt (a weapon of the god Indra) or Diamond. The vajra is a sacred symbol in Buddhism, Hinduism and Jainism representing the properties of both the diamond and thunderbolt. It can signify: indestructibility, firm determination, spiritual power, clarity of mind, and the forceful movement of the psychospiritual energy within the subtle body. Anyone who has spent time learning and practicing this posture figures out pretty quickly that it calls upon a deep inner strength and willfulness to successfully go down, hold, and come back up. An old pic of me from 2004 in Mysore with Guruji & Sharath. 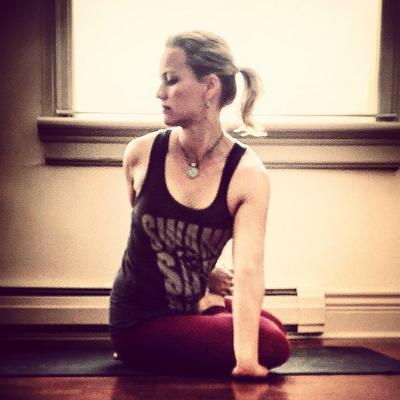 Shalabhasana "locust pose" This asana is very therapeutic. In most cases it can be extremely helpful in relieving & recovering from back problems. However, it is not an easy posture to practice correctly and there is nothing gratifying for the ego in it! Maybe that's why it holds such sweet benefits for the practitioner! 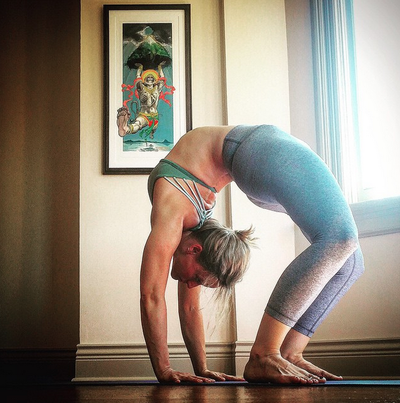 The foundation of this pose is the full belly from the pubic bone to the bottom ribs, the legs are internally rotated, pulled strongly together, and reaching away from the spine. Try to keep your legs as straight as you can! (Not bending the knees is very challenging!) The breastbone extends forward and up and the shoulders roll back bringing the shoulder blades together along the back of the body. The drishti is the tip of the nose! There are two forces of opposite energy at work in this pose to make the curve of the spine happen. The top part of the body is pulling forward and up, and the lower half of the body is reaching backwards and out. Between these pulls of opposition your inner self sits peacefully, unaffected. Ustrasana = Camel Pose Camels are associated with journeying. From a symbolic perspective they are superiorly equipped for the long-haul. 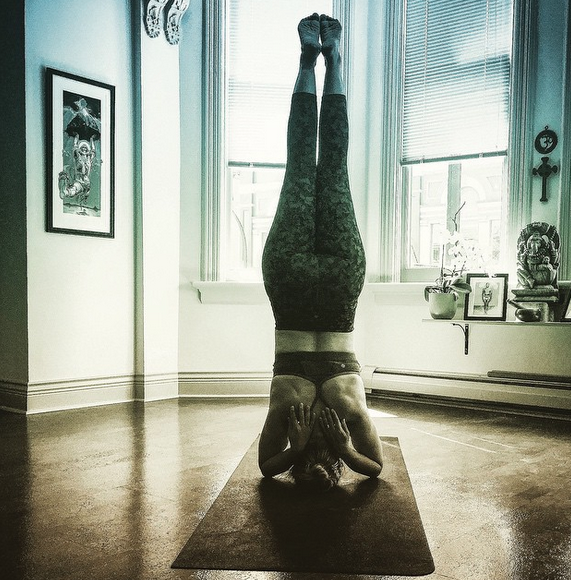 When it comes to a daily Ashtanga Yoga practice, we may find ourselves stuck in a dry spell. It can last for days, weeks, months, and sometimes even years. When you find yourself traveling through the desert of your practice it might be helpful to take inspiration from the humble camel who is an expert at conserving energy and crossing arduous terrain with ease and steadiness. When you are practicing yoga to reach the ultimate expanse of Self-Realization, you are in it for the long-haul. Like the camel, pace yourself, but keep moving forward without ceasing, without being discouraged, no matter what the conditions of your body, mind or life may be on any given day. When you reach an Oasis be sure to drink and soak up all the nourishment you can so that you'll have some reserves to draw upon when you are again in need. For me, time in Mysore practicing with my teacher has been a great Oasis and helps to carry me through the rest of the long dry year. Be sure to regularly celebrate any gain you make - small or large, and don’t look back - you’re not going that way! Photo Credit Bill Brundell, 2004 Mysore India. Krounchasana "Heron-Posture” The in-between times can be challenging. Transitioning, waiting, wondering, feeling neither here nor there. Yet, these can also be the most magical and fruitful times of self discovery. The heron is a solitary bird. Like the Yogis (true seekers of Divine Union) it prefers seclusion and privacy. This bird finds home in water, land and air, symbolizing an ability to transition easily between states. If you have ever watched a heron you will notice that it embodies gracefulness and tranquility. It has a deep inner stillness to its movements that are both fluid and yet static. Much like the quality we attempt to cultivate through our yoga practice. It's patience & stillness are not inactive or lazy, but contains the sharpest awareness to all that surrounds. The heron hunts during the twilight hours. In India, twilight is a sacred time. It is also a time of transition: not quite day or night. Twilight is said to be a period when the veil between the spirit world and our world is thinner and mystical occurrences can readily happen. The heron itself depicts this quality of being able to move between worlds as it is often depicted standing with one foot in the water or on the land and the other foot in the air, as it is in the asana that bears its name. This ability to live at peace while moving in-between states or worlds is something a practitioner of Yoga needs to get comfortable with. 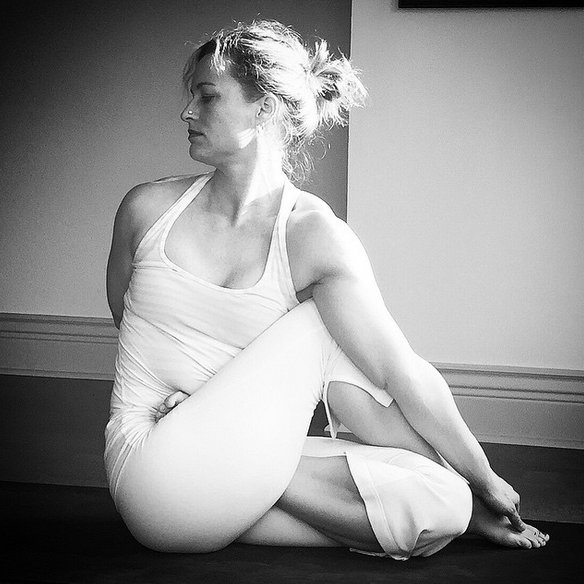 In fact much of the practice is teaching us to find a deep inner stillness while our body or mind is moving through transitions of all different types: from something as tangible as the physical Vinyasa between two asanas, to more esoteric movements of the Spirit. Marichyasana A - dedicated to the sage Marichi (meaning a ray of light) As this posture is named after one of the ten son's of the god responsible for creating the Earth (Brahma) it makes sense that this group of postures has a strong rooting action, and cultivates a deep sense of reverence towards the Earth. We experience this especially in the first and second variations A & B, as well as in Marichyasana E & G (found in Advanced B series) where the whole body is bowing down, and the head or chin is touching the floor. In the "A" variation the head touches the extended leg, which is active and as a result of this energy it presses into the ground. Bharadvaja is one of the Seven Great Rishis responsible for transmitting the teachings of the Vedas. He was extraordinarily gifted intellectually and spent many years studying the Vedas and in deep states of meditation. In one story, he performs such rigorous austerity to Lord Indra that his body becomes so weak he could hardly sit. Indra eventually appears and blesses him with an even deeper understanding of the Vedas and sends him onward to visit Shiva in Mount Kailash to receive a blessing equal to the complete mastery of all the Vedas. Indra warns him though that 'although gaining Vedic knowledge is important, spreading it is equally important.' Bharadvaja takes this advice to heart and becomes honoured for spreading this Vedic wisdom and using it to free society from all kinds of suffering and war. Many Kings sought his counsel and a long period of peace and prosperity was fostered through his influence. Kurmasana – “Turtle Posture” & SuptaKurmasana – “Sleeping Turtle Posture” Kurma is the second avatar of Vishnu. Turtles are emblems of steadiness, longevity, and wisdom, which are all prominent qualities also cultivated through the regular practice of Yoga. 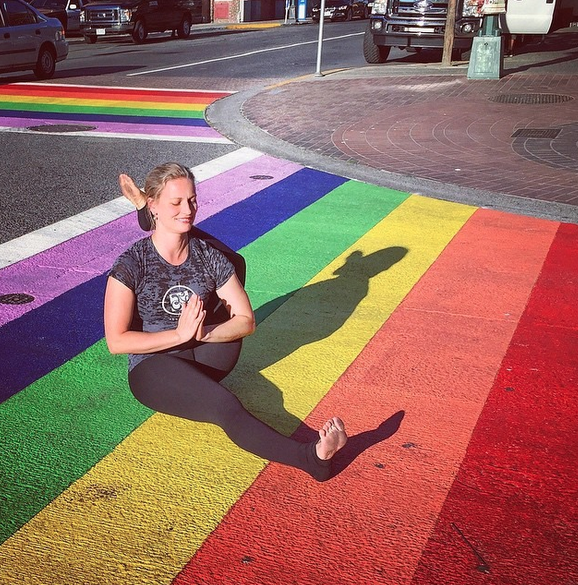 I cannot help but think about the Samudra Mathanam, the story of “Churning the Ocean of Milk” whenever I practice Kurmasana. This is perhaps one of the most well known stories from Puranic scripture. Due to Indra’s giant ego, all the Devas (benevolent supernatural beings) are cursed by the irascible sage Durvasa, to loose all their strength and good fortune. A battle between the Devas and the Asuras (power-seeking, maleficent deities) ensues, whereby the Asuras gain control of the universe. The Devas seek help from Vishnu, who suggests they churn the celestial ocean to bring out the nectar of immortality to regain their power and strength. This however, is such a colossal task, it requires an alliance to be formed between the gods and demons, as they will need to work together to jointly churn the ocean. 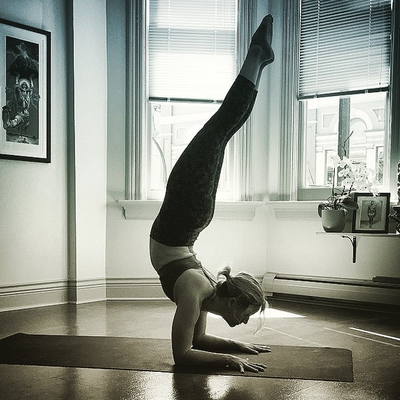 UrdhvaMukhaPaschimattanasana = "upward faced paschimattanasana" This is a variation of paschimattanasana. In the state of this asana the drishti is to the tip of the toes. The chest and thighs are pressed together. The shoulders are relaxed. 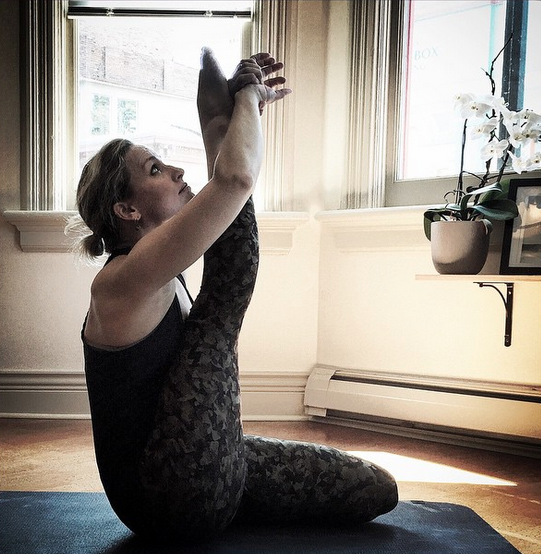 You enter this posture by rolling up from the floor with straight legs while holding the sides of the feet. There is actually a lot going on in this posture. It requires many earlier aspects of the Primary Series to be successfully integrated. 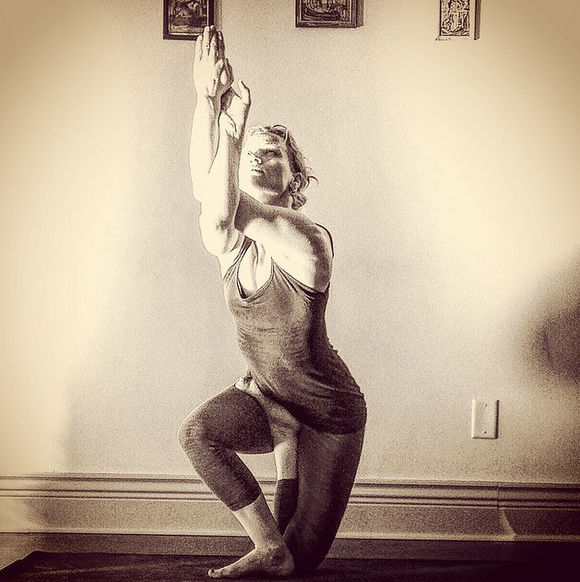 Personally, I love the dance that happens between strength, flexibility and balance in the practice, learning how to release the effort just the right amount to feel comfortable in any asana. It really is a test for Patanjali's Yoga Sutra II:46 - can you be both steady (sthira) and at ease (sukha) here? 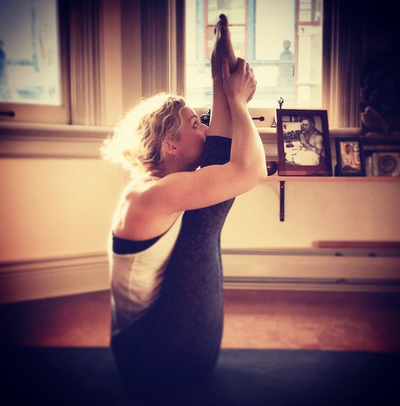 EkaPadaSirsasana "One-Foot-behind-Head-Posture" Eka = one / Pada = Foot, Leg / Shirsha = Head / Asana = Pose, Posture, Seat A Victory of Love! This #asana requires a significant amount of openness through the hips and hamstrings, coupled with great strength through the abdomen, back and neck. It is definitely not a position that comes naturally to most people! It certainly didn’t come easily for me in the beginning. Over time, with kindness and compassion, we can coax the necessary areas of our body and mind open and strengthen the weaker parts, bringing into existence that which once seemed impossible, showing that all things are possible with dedication, determination, persistence and LOVE! 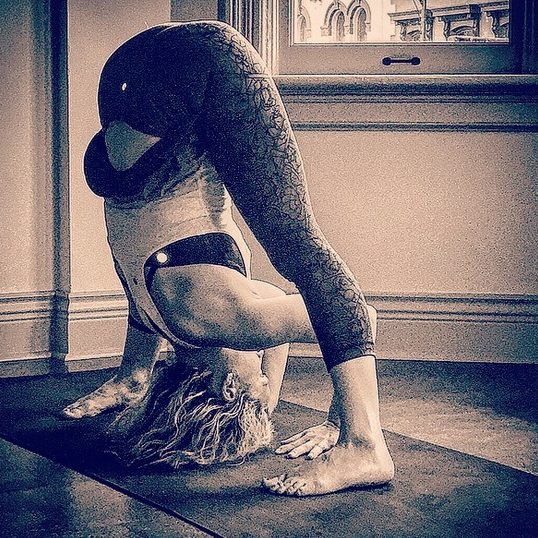 vrschikasana - vrschika = scorpion Scorpions are famous for their ability to sting. The mind has often been compared to a 'drunken monkey bit by a scorpion.' Just as a monkey in this condition would move erratically and violently, so the mind jumps uncontrollably from one thought to the next, and is constantly distracted. 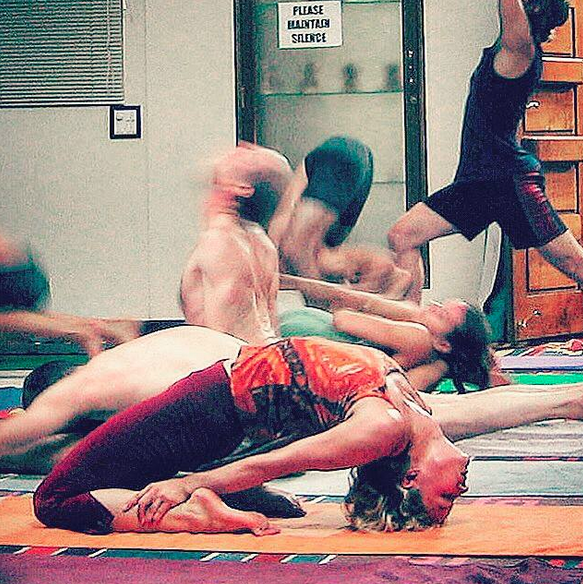 Yoga teaches is to control, tame and direct this insanity. This asana is one that certainly requires a steady and directed mind. The monkey mind must become calm and focused on the breath so the head and feet can come together while balancing on the hands. Believe it or not, resting the feet on the top of the head can bring a certain calming effect to the naturally distracted mind, making this posture both stimulating for the central nervous system and soothing as well, like the bite of a scorpion which both stings and paralysis its victim. It is a physical depiction of the balance between the Ha & Tha - the energies of the Sun & Moon. Containing within it the paradox of simultaneously holding two opposite forces together, which is truly the essence of Yoga. 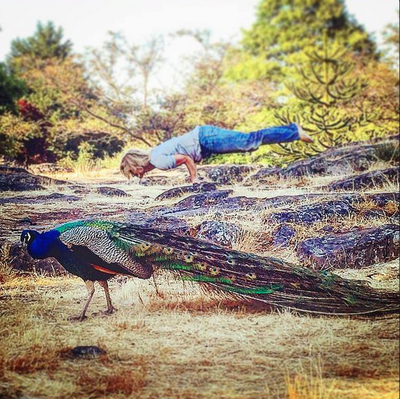 PinchaMayurasana = "Peacock's Feather Posture" Pincha = Feather / Mayura = Peacock / Asana = Posture, Seat In India the feather of a peacock is a symbol of good luck, prosperity, beauty, and wisdom. It is a protection against evil and is thought to destroy all poisonous emotions like anger, greed, and jealousy. One identifying feature of Lord Krishna is the peacock feather in his crown. MuktaHastaSirsasana C Day 30: Final Day of #yogagivesbackchallenge Patanjali’s Yoga Sutras start with: Atha yoga anushasanam (YS: I:1) Translated it states: "Now, instruction in yoga.” The dictionaries tell us that yoga primarily means union, junction, or connection. It’s goal is the attainment of oneness (kaivalya) - but this realization must be experiential. It cannot be understood through the use of words or with mental constructs. We must go beyond the mind to truly understand the very essence of our BEING to experience what UNITY actually IS. Yoga has also come to mean the efforts and practices which are helpful in moving us closer towards the fulfillment of this Oneness, and removing the coverings that cloud the light of supreme awareness or cosmic consciousness within ourselves. May we always remind ourselves what the true goal of yoga is as we practice. It is easy to get caught up in the external, but this is not really a good representation of the real practice nor its result.